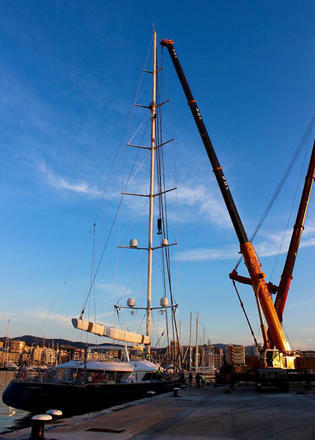 The world’s tallest aluminium mast has been unstepped at RSB Rigging Solutions in Mallorca, as the 56 metre Perini Navi sloop Bayesian is prepared for an extensive refit. The 74 metre tall rig was prepped by the RBS team alongside Tony Hawker from Florida based Seahawks Rigging. 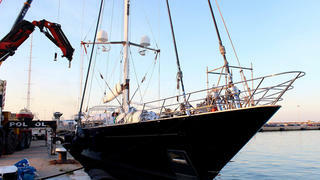 The unstepping was carried out earlier this month, shortly after the sailing superyacht (formerly known as Salute) arrived into the Balearics. 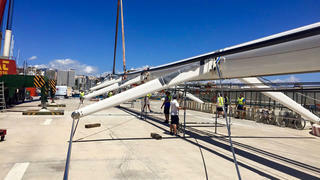 Steve Branagh, founder of ‪‎RSB Rigging Solutions, said: “We have hit a number of impressive milestones in the last few years giving us the well earned reputation of being the ‘go-to’ ‪‎rigging‬ company in the Mediterranean‬. The refit will be carried out in collaboration with Astilleros de Mallorca, and Mr Branagh added that the whole process will take around three months, with the mast due to be restepped in September. Launched in 2008 by Perini Navi, Bayesian is one of the 50 largest sailing yachts in the world and her mammoth mast supports a total sail area of almost 3,000 square metres. Her naval architecture is by Ron Holland and Perini Navi, while interiors are by Remi Tessier — it is not yet clear to what extent these will be modified by the current Mallorca refit. Other recent projects completed by RSB Rigging Solutions include supplying the full running rigging package on the 46 metre Vitters sailing superyacht Unfurled.